Established in 1974 at Izatnagar,Rregistered under the Societies Registration Act of India, Original Registration No. 802/1980-81. IAVP CONGRATULATES TO DR C. BALACHANDRAN, FORMER REGISTRAR, TANUVAS AND DEAN (RETIRED), MADRAS VETERINARY COLLEGE AND FORMER VICE PRESIDENT, IAVP FOR STATE TANSA AWARD, 2014. 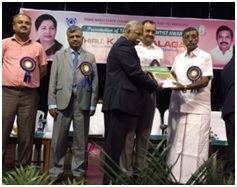 Dr C. Balachandran, Former Registrar, TANUVAS and Dean (Retired), Madras Veterinary College and Former Vice President, IAVP received Tamil Nadu State Council for Science and Technology Award called TANSA for the year 2014 in Veterinary Science for the contribution to Veterinary Pathology from the Hon’ble Minister for Higher Education of Tamil Nadu Shri K.P Anabalagan in a ceremony held on 25.09.2017. The objectives of this scheme is to encourage and honor scientists and researchers who have contributed significantly in their fields of specialization through their skill pioneering and outstanding applied research work and other such activities leading to S&T development in the Tamil Nadu State. Selected scientists are given Rs.50,000/- in cash and a citation. IAVP congratulates, it’s very active member Dr C. Balachandran for this great achievement and wishes him for such more recognition and honors in future too.